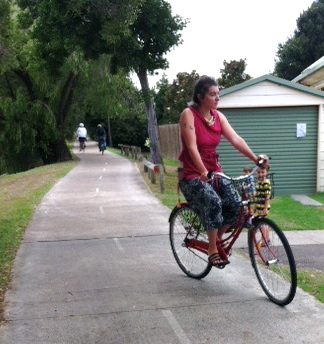 ← Bikes seen around Newcastle lately and coffeeneuring prize received! I have seen several young women wearing these drop-crotch, loose, long pants around town when riding their bikes, and they struck me as being the perfect pants for bike riding, especially in summer. The pants billow out, sail like, and look striking from a distance, as well as having many practical qualities for bike riding. Finding the perfect riding pants can be difficult, as many riders will attest. And when jean manufacturers such as Levis, or sporting gear manufacturers suc as Ortlieb, market the perfect pair of riding pants, they are often over priced, impossible to find, or both. They incorporate such features as treated fabric to make them water and stain resistant as well as odour free for those sweaty rides, U-lock brackets for carrying a lock on the waist (which strikes me as very uncomfortable). They are also often cut to prevent them from riding too low on the waist (and exposing the dreaded and derided plumbers crack) and with extra fabric in the crotch area so they do not get uncomfortable on the bike. Other features might include reflective trims on small areas such as on the insides of the leg seams so that when they are rolled up the reflective tape is revealed, even though the amount of reflectivity would be so minuscule as to be practically ineffective. I have not worn any of these specially manufactured jeans. Normal jeans can be good for riding in, especially skinny jeans, but the tightness of them around the calves I find to be a sweaty and restrictive experience, while wearing a looser fit leads to them catching on various parts of the bike. So when I saw these pants being worn, I could see the advantages they have to offer for this purpose: made from light cotton makes them perfect for summer, a loose waist can be worn as high or low as you like, the harem style bottoms can be worn below the knee or at ankle length and they will not catch on the bike, nor cause sweaty and uncomfortabe calves. Crotch tightness is obviously not an issue. They are also available at various price points. The only disadvantage I can see in them is that if the crotch were too low, they could not be worn on a diamond frame bike. Now, if a clothing manufacturer were to make them with reflective elements in the pattern …. perfect! This entry was posted in Uncategorized and tagged clothing, cycle chic, speedwell, street cyclist, Throsby Creek, women on bikes. Bookmark the permalink. Yes! I have a pair of these pants that I sent back when we traveled in Turkey. I’ve never thought of wearing them on a bike, but now I see the distinct advantages. Mine are a purple, gold, and green leafy pattern and would pair well with almost any top that I own. I’m glad this post has helped others see the potential of this style of pants, Annie. Also, I’ve tried to comment on your blog a few times lately and the comment does not go through. I am moderating comments now. Does it say something to that effect? No, it stops allowing me to finish the comment process, I don’t get to type in the captcha letters, and after I’ve just typed out a comment and my details I just give up. It’s also happened on other blogspot sites so it may well be a problem at my end. I have captcha (or whatever you call the string of letters one needs to type to prove you’re not a computer) turned off. Your comment should go into holding area where I then preview before releasing to public. I’ll keep an eye on my comments and see if there are any more WordPress users having difficulty with my site. I can share an experiment. I don’t like bike dedicated garment with sort of diaper. So, I’ve cut a cheap cotton jean above my knees. Before buying the jean take care about back pockets and over-stitching*, they do not be low. It can be also consistent with long distance riding then, in this case with a randonneur bike, main part of weight is both on legs and arms, not on the narrow saddle. *I grab this word in my dictionary, I hope it’s the good one : I mean visual seam between skin and saddle which can be nasty . That’s a good strategy Laurent. 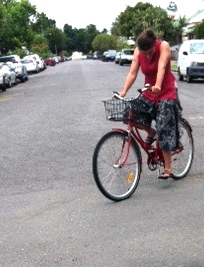 I also cut off jeans to ride in, though I had not thought to check the insides of the seams first.